According to the FBI’s latest report, the National Instant Criminal Background Check System gun control database (“NICS”) now has 30,973 records of people who have renounced U.S. citizenship, up by 856 since last month and 3,733 in the first seven months of the year. This means the State Department has extracted nearly US$8.8 million in renunciation fees from people seeking to exercise their human right to change their nationality. 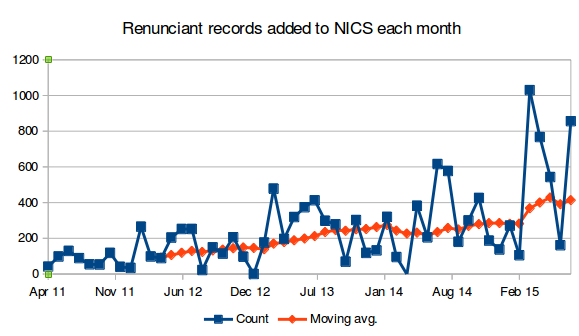 Above you can see a chart of monthly additions of renunciant records to NICS since April 2011. The twelve-month moving average now stands at 414 renunciants per month, up by 61% since a year ago. In addition, I estimate there have been around 2,500 to 3,000 no-fee relinquishers since the beginning of the year (based on a potentially-outdated ratio of renunciants to non-renunciant relinquishers), as well as more than 10,000 people giving up green cards (based on USCIS statistics from 2013). And some consulates have a backlog of renunciation appointments up to ten months long as of April. Based on the the Q2 Federal Register list and its absurdly small total of 460 “published expatriates” over three months, the Wall Street Journal and their sources seem to think that there has been “a leveling off of sorts after a flurry of renunciations as Americans reacted to Fatca and global banking challenges”. The NICS reports offer no support for that idea: the last “leveling off” of the 12-month moving average was between August 2013 and August 2014, during which period it remained in the 240 to 260/month range. Since then, the monthly average number of renunciants has resumed its upward trend. A little over three years ago, in April 2012, the twelve-month moving average was just 92. And five years before that, during 2007, the FBI was adding an average of just 26 renunciant records to NICS each month (compare the year-end renunciants 2007 operations report to the 2006 one). Meanwhile, 124 Kyrgyzstanis and 817 Ghanaians gave up their respective citizenships in 2013, while 3,400 Pakistanis became ex-Pakistanis in the past five years. According to the regulations (62 FR 34634, 34638), the NICS “renounced U.S. citizenship” category includes only people who swore an oath of renunciation of U.S. citizenship under 8 USC § 1481(a)(5), not people who commit relinquishing acts under other paragraphs of 8 USC § 1481. The IRS’ list in the Federal Register, in contrast, claims to include all people who have “expatriated” under the definitions in 26 USC § 877A(g)(2) and (4): anyone who gives up a green card they held in eight of the last fifteen years, as well as anyone who gives up U.S. citizenship under any of the first five paragraphs of 8 USC § 1481(a). As we’ve pointed out before, the IRS’ claim is mathematically impossible. There does not seem to be any legal basis for the IRS to exclude names of ex-citizens from the Federal Register, though it’s hard to tell since the law is so badly-drafted. A few caveats. The “addition” figure for April 2011 refers to all additions since December 2010. The “addition” figure for May 2012 in the above chart (though not in the below table) is interpolated because the report for that month is missing. Finally, the “addition” figure for October 2011 in the chart has had what the FBI described as a “backlog” of 2,900 renunciant records subtracted out, leaving an estimated 206 then-current additions for that month (even though some of the backlog may relate to other periods covered by the chart). Excellent work again, Eric. Is there any way to find out of one’s name is on the list — other than applying to buy a gun? Awesome compilation, Eric! Have you sent this to Annie Hill at the WSJ? As always @Eric, your skills allow the rest of us access to data and interpretation of same that we could never do on our own. Why ‘journalists’ at large media outlets – inside or outside the US can’t/won’t use their own researchers and access to information to do the same, or verify yours floors me. Andrew Mitchel has been downplaying the numbers since he first started reporting on them. He continues to look only at the surface no matter that by now there is good reason to question them. It continues to be very convenient for the US to underreport the actual surge in renunciations and relinquishments. This needs to be put into the hands of a competent investigative journalist, along with evidence that multiple FOIA requests for expatriation data have been declined or ignored. It is time to force the truth to the surface (using depth charges if necessary) that CBT, FATCA and FBAR are forcing Non-Resident Americans to renounce/relinquish US citizenship. There is a story here that needs to be told. Another brilliant and complex analysis, Eric. Thank you again. I clicked on Eric’s 1st link, “FBI’s latest report”. It’s worth looking at this to see again their list of the types/categories of persons that includes renunciants. It’s absurd for anyone to claim the numbers are levelling off as if the number desiring to renounce were levelling off or decreasing when consulates stop even accepting requests for appointments when there are too many already in the queue and then issue appointments well into the next year when they do. And after that there is a huge variation in processing speed. Still waiting for my CLN 5 months later and I understand that isn’t a particularly long time add this goes. @RLee, then, as has been noted here before – there is the effect of the newly raised extortionate 2350. renunciation fee – which if it is a couple or a family is multiplied accordingly. How many families of modest income can spare 2350. in order for one person to renounce, much less several? And that doesn’t count the fees for the final filings IF the person decides to be compliant with the 8854, and to get help with backfiling 5 years if they aren’t already ‘compliant’, plus as usual, the incomprehensible final forms. Those not born in the US, with a non-US place of birth on their passports are not going to come forward now – unless they have a compelling reason to feel that they will be outed. Those with a US birthplace who decided not to ever enter or travel through/over the US again, and who so far have not been denied banking by financial and non-financial institutions complying with FATCA may still decide to just lay low and take their chances. Perhaps they have decided that they don’t need a CLN badly enough. Why is all this so obvious to us, but lawyers like Mitchel and most journalists remain oblivious or willfully blind to these very real factors? Some prefer the narrative that the numbers are low and that they are levelling off or decreasing because it fits their political or personal agenda and preferred worldview. However if you want to check other people’s names you have to be an actual gun dealer enrolled with the FBI, and I believe also to sign an agreement that you’ll only use NICS for doing background checks on actual prospective buyers and no other purposes. @badger: In fairness to Andrew Mitchel, he coined the very useful term “published expatriate”, which allows people to discuss the Federal Register list without implying that it includes all expatriates. Sadly the media haven’t picked up on this wording. Renunciations are just a symptom of the overall FATCA problem and what value people put on US Citizenship. What the US Government is claiming is like saying Colonist Support for the King has increased a month after the Boston Tea Party. Always remember who generates the figures, certainly not an independent commission. @Eric, thank you for the information about how to check if one’s name is in the NICS database. I may pursue it, depending on the fee required. Because I relinquished US citizenship upon becoming a Canadian citizen, rather than renouncing US citizenship as a “dual” citizen, I am interested to know whether information about a person like me gets into the database — that is, whether the FBI gets copies of the CLNs of relinquishers who have not renounced US citizenship..
FBI NICS statistics for June 2016 show 454 renunciations. For the first six months of 2016, 3,362 US citizens renounced their US citizenship according to FBI NICS records. 2016 looks to be another record year for US citizens seeking their freedom. Naturally they don’t have a Law Obedience Information Services Division. Like all homelanders, they can’t imagine the possibility that a non-resident US citizen might obey laws. FBI NICS statistics for December 2016 show 430 renunciations. For the full twelve months of 2016, 5,337 US citizens renounced their US citizenship. 2016 looks to be a banner year for US citizens seeking their freedom.